The name “Hooters Hall” is unique, it’s taken from an original farm in Staffordshire, owned by my Great Grandfather and no longer in existence. 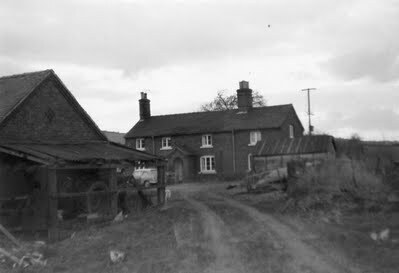 This picture, fairly obviously, is the front of the farmhouse, as seen from the farm track. 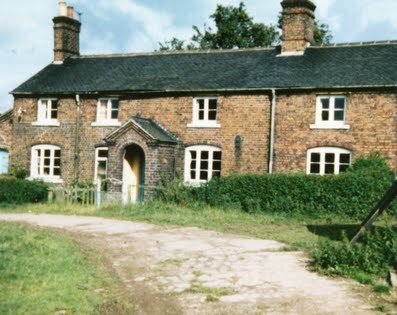 Typical of the time, the front door seen here, as well as the main parlour, which is behind the window to the right, were kept “for best” and were hardly ever used. Even my mum hardly ever saw the parlour, and the front door was only used if someone got married! 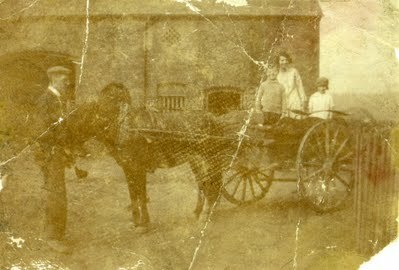 This one shows my Great Grandad, he’s the one holding the horse, in front of the barn and dairy room, which is through the doorway to the right that can just be seen behind the cart. The main barn is on the other side of the building but we don;t have a photo that shows that clearly, although I have memories of playing in between the bales with my younger brother on farm visits. I only even got into the dairy room once, which wasn’t used by this point, because the farm had a vicious dog, called Ben, who was always chained up in that doorway that we were scared stiff of. This last one of the farm is the view from further down the track, it doesn’t give a full idea of how all the buildings related to each other but does show the one last building that doesn’t appear in any of the others, the cattle shed to the left of the picture with the tractor under the lean-to. 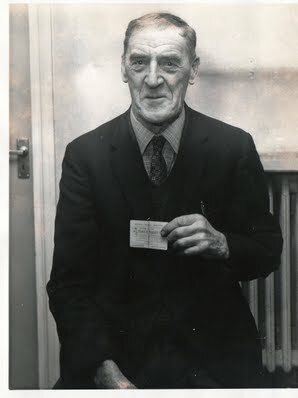 Any finally the man himself, my Great Grandad, Norman Brayford. I don’t know if he was camera shy or if it’s just the general lack of pictures of the farm from that period but there are very few photos of him in any of the family albums.